Back in the early 1980's, I wanted to build a seagull window. Since this was before the Internet, I had to draw the design myself without the aid of google, scanners, projectors, etc. I built the above simple seagull design with only 28 pieces and measuring about 18" x 24". It still hangs today in one of my sister's house in Atlanta. In September 2016, my sister Jeanne visited from Atlanta for a 3 day workshop to polish up her stained glass building skills. 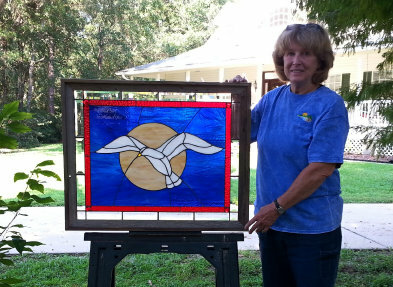 In 3 days of intense effort she was able to complete the window above, also framed in the same "driftwood look" frame. She took a little different route by having the seagull in front of the moon in a night sky. The effect in sunlight is dazzling with the bold colors and sparkling of the bevel prisms. Over the years, I've wanted to "fancy up" this same design..... making it a bit larger and more complicated. 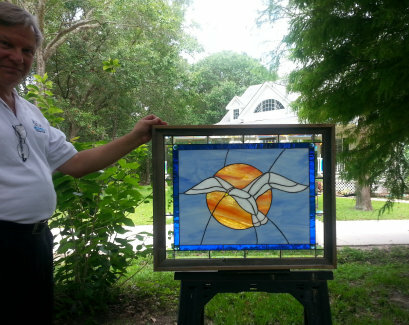 Early this year I was helping my friend Jan perfect his stained glass building skills. He completed a couple of noteworthy projects and was ready to try something a little larger. I re-drew the seagull window into 2 versions. The first I kept at 28 pieces and shrunk it a bit so that it would fit a standard 18" x 24" frame. The second version added a color inside band with jewels and a 1.5 inch outside border that could be any color glass or 1.5" clear bevels. Adding these features increased the window to 60 pieces and its size to fit a standard 22" x 28" frame. Jan had found the perfect rustic "driftwood" looking frame this size at a local hobby store that matched the seagull concept. Over the next few months I watched Jan build 3 of the smaller design... one for each of his 3 children for Christmas presents. In each he used Spectrum Inferno glass for the sun ..... the perfect "fiery sunset" glass. To the left is a photo of one of Jan's 3 identical windows finished in December, 2015. I have another friend that has a copy of this pattern and is diligently working on her version of this design. Stay tuned and I'll provide pictures when she completes her work! I'm hoping when I get a little extra time, I can build a seagull window for myself! 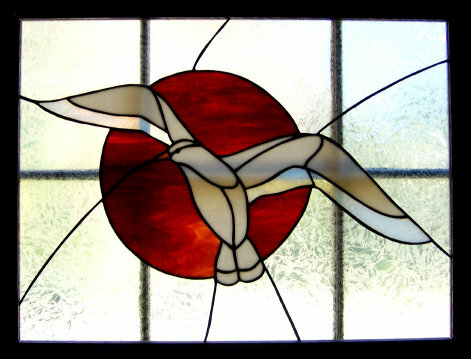 After mastering his 3 smaller seagull windows, Jan built the larger window (above) for his wife. This window contains 60 pieces of glass, was built to fit a 22"x 28" frame, and was completed in June of 2016. Adding the dark blue waterglass band, the 4 jewels, and the beveled border should make this window spectacular in the sun! What a masterful job! He tells me he has now "graduated" from seagulls! I am most curious to see his next project!